'Spider-Gwen Vol. 5: Gwenom' takes the character to heights (and depths) – AiPT! For the past few months, Marvel has been "Venomized," as everybody’s favorite symbiote has infected nearly every corner of the Marvel Universe. Included in that list is Gwen Stacy, known as Spider-Woman to some. The symbiote has taken a hold of the usually optimistic Stacy, throwing the entire universe into upheaval (a universe that is already pretty upside down to begin with — Matt Murdock is the Kingpin for crying out loud!). As a result, the latest arc of Spider-Gwen has the opportunity to explore morality, and if the ends always justify the means. Gwen goes down an uncharacteristically dark path, but if it ends up being for the greater good, is it justified? Oftentimes even she doesn’t know the answer to that, as the symbiote clouds her vision and even her perception of who she is. Despite her new bodymate cohabitating her brain, her mission remains clear: take down the evil Matt Murdock for good. Jason Latour’s aforementioned exploration makes for a solid story. Some of the pacing did feel a bit uneven, however. Right before the big showdown, for instance, we’re given almost an entire issue’s worth of exposition in the all-too-common form of a supervillain explaining each and every one of his motivations. 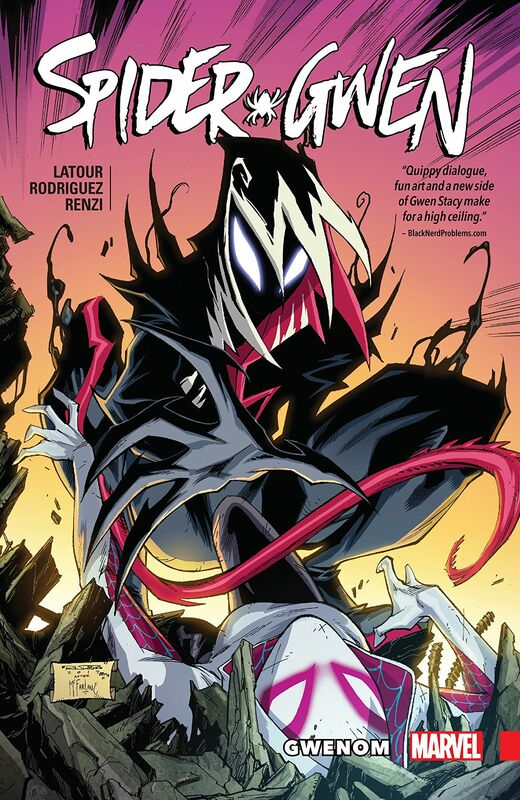 This volume is also a pretty big shift tonally for the series, which is to be expected in this Venomized version of Gwen, but important to note all the same. This is not quite the same Gwen Stacy we met all the way back in the "Greater Power" arc, but why would you want her to be? The journey is the destination, maaaann. The story is solid, but in my opinion, the real highlight to this series if Robbi Rodriguez’s art, further propped up by Rico Renzi’s eye-popping colors. Gwenom looks absolutely fantastic, the shadowy, nearly all black silhouette juxtaposed against deep purples and grimy, olive greens. The colors are extremely bright and vibrant, without ever straying into ’80s neon territory. Combined with Rodriguez’s highly stylized art and some seriously sharp inking, Spider-Gwen is a feast for the eyes. I could gush about the art between the covers for days, but the covers themselves deserve honorable mention as well. Rodriguez handles cover duties as well, and they are out of this world. I need a print of Spider-Gwen #29’s cover framed and on my wall, stat. The bold use of solid colors and stylized, deliberate linework makes every page Rodriguez drew astounding. Veronica Fish and Olivia Margraf lend a hand in the middle of the arc, in issue #27, and they emulate Rodriguez’s signature style in such a way that their artwork is differentiated, but not jarring. All too often when books switch artists midway through an arc (or even an issue) the transition is so jarring it takes you out of the story. Thankfully, that is not the case here. From beginning to end, even if the story wasn’t good, Spider-Gwen would be worth flipping through for the art alone. Spider-Gwen has been one of Marvel’s sleeper hits, as what began as a one-off blossomed into the surprise series of the year. Jason Latour and Robbie Rodriguez should be proud of how they’ve pushed the Gwen Stacy character to new heights. Latour and Rodriguez’s series is unfortunately reaching its conclusion next arc, so pick up Gwenom and enjoy it while you can. While this volume marks something of a tonal shift, the same smart writing and out-of-this-world artwork that has made Spider-Gwen one of the most pleasant surprises in comics is still present as ever. While this volume marks something of a tonal shift, the same smart writing and out-of-this-world artwork that has made Spider-Gwen one of the most pleasant surprises in comics is still present as ever.